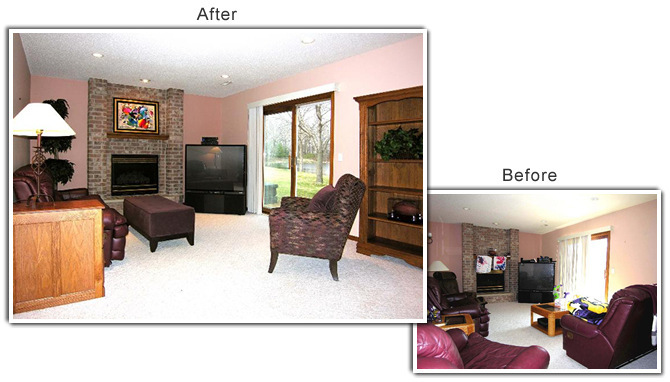 The lower-level family room of this Chaska home offered wall-to-wall carpet, a brick fireplace and sliding glass doors leading directly to a back-yard patio and pond, but heavy furnishings were a distraction from the home's positive features. "The owners used this room quite a bit, but there was just too much furniture to effectively play up the positive selling points of the space," said Lori Matzke of Centerstagehome.com. The leather lounge chairs and loveseat were put in storage. Large matching side tables and the coffee table were also removed. Wall sconces over the sofa, the kids' artwork on the mantel and toys were boxed up to free the space of distractions. An eggplant-hued ottoman, part of the upstairs living room set, stands in for a coffee table. A coordinating side chair in a soft eggplant pattern was also borrowed from the living room to create continuity between the spaces. The velvet upholstery softens the visual impact of the leather sofa and the hard fireplace, while the new arrangement shows a more open floor plan and draws the buyer's eye directly to the positive features. A bookcase that was taking up too much room in the first-floor living room was used to help balance the fireplace and add height to the room. The bookcase was accessorized sparingly to keep the room from feeling crowded. A small oak filing cabinet that had been crowding the home office area stands in for a side table. Moving the big-screen TV out of the room was not an option, but moving it to the corner and decluttering the top draws less attention. Bright artwork over the mantel helps draw more attention to the fireplace and downplays the television. A large silk topiary, also moved down from the main level, balances the space by adding color, height and visual interest in the far corner. Opening the blinds and the sliding glass door gives the room a better view of the pond and more natural light.